Not long ago I’ve been recommended to go to the Giant Steps and try their coffees; it was a fantastic day yesterday so my family and I went on our little day trip to Healsville. We’ve never driven to the National Park side of Victoria before, so it was quite an adventure. The scenery along the way really puts you into the mood for a nice brunch and some wine tasting. We left at 10 and got there around 1130 which was before their breakfast menu close (at 1200). We have later ordered a glass of their 2008 Sexton Vineyard Pinot Noir 10$ and Chardonnay 10$ plus a Cheese Platter (See Photos) 25$. 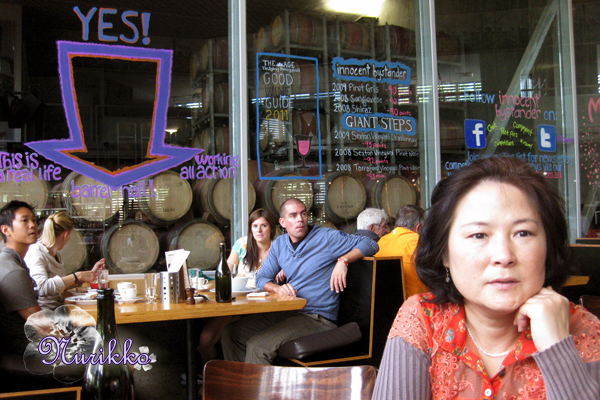 I enjoyed the relaxing atmosphere Giant Steps provided – their cafe, bakery, pizzeria and wine storeroom are all displayed on the premise so you know that they are all real and made in front of you! Categories: $ Cheap eats (below 15), $$ Moderately priced (15 - 30), Afternoon Tea, Bakery, Bar (Licenced), Breakfast, Brunch, Cakes / Patisserie, Coffee, Dessert, Favourited, Healsville, Hit, Lunch, Mediterranean, Modern Australian, Outdoors, Pizzeria, Recommended, Traditional / Authentic, Vegan Friendly, Vegetarian, Wide Range Beverages | Permalink.